For over three decades Armstrong Roofing has been installing Spray Polyurethane Foam (SPF) roofing systems on San Francisco Bay Area’s flat and low sloped roofs because they provide unsurpassed protection against the elements, excellent energy efficiency, low maintenance and start to pay for themselves the moment they are installed. However, SPF roofing also has a number of distinctive benefits which most people do not really consider unless they are roofing experts or happened to have had roofing issues related to these areas. Flat roofs do not all have the same shape or design. In fact, most roofs have their own unique set of challenges which must be addressed effectively to avoid roofing system failure. Due to SPF roofing systems’ incredible adhesive qualities, which are the result of the chemical bonding of the materials, it can conform and adhere to horizontal, vertical and irregular shapes as well as any protrusions. This unique quality of SPF roofing means that your roof will be seamless and will not need costly flashing material which sooner or later will fail and cause damage to your roof. Seams eventually fail because of expansion and contraction which permit water and microbes to seep in. Unlike traditional roofing material, which comes in prefabricated shapes and sizes, SPF can be applied to any roof design effectively every time without costing you extra time and money. Whether your flat roof system is part of your commercial building or home, you most likely have rooftop installations. These installations are potential causes for roof failure if you decide to install traditional roofing material which will create seams around any object installed on your roof. What’s more, if it is necessary to perform maintenance on objects located on your roof, foot traffic can loosen or damage traditional roofing material. These potential hazards can be eliminated by installing an SPF roofing system. What is more, if you have sealant and flashing around any roof penetrations, for example, vents for your range hood, dryer, HVAC, skylights and chimneys, these can split and allow moisture to seep into your roofing system. Whereas with a seamless roofing system you will not have to worry about splitting around any roof penetrations. An additional consideration is that SPF can provide insulation and protection for exposed duct systems. Since spray foam can adhere to your duct surface, it will provide insulation and improve the efficiency of your HVAC system. It can reduce the possibility of air leaks and maintain the proper temperature inside and outside the duct system. Many homes and businesses have multiple roof levels and/or even multiple types of roofing systems. In situations such as these, the potential for leaks is high because of normal expansion and contraction processes and the frequent seismic activity we experience in the San Francisco Bay Area. 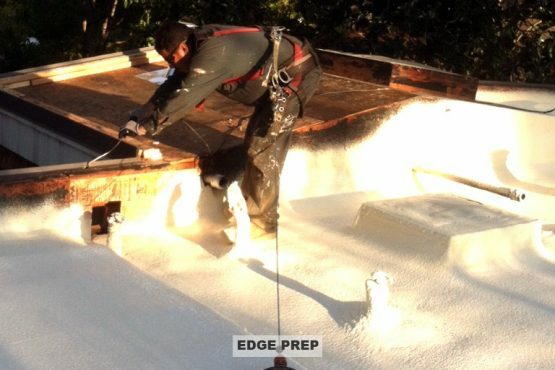 SPF roofing provides one of the best solutions since spray foam roofing is seamless. As a result, any joints between different types of roofing systems are protected and therefore moisture is unable to penetrate them and damage your roof. If you have a low sloped or flat roof home or commercial property, by installing an SPF roofing system you will not only save enough money to pay for the cost of your new roofing system but you will also extend the life of your roof as well. SPF roofing is considered a sustainable roofing system since it has a long life, it is renewable, energy efficient, increases the durability of buildings, prevents moisture penetration, and unlike traditional build-up-roofing systems, it produces very little waste. For more information about SPF roofing systems or to book your Free Estimate, please contact Armstrong Roofing today. Our extensive experience in SPF roofing coupled with the best, longest-lasting warranties available means that you won’t go wrong with Armstrong. Before considering any other roofing system for your flat or low-sloped roof, let Armstrong show you why our San Francisco Bay Area SPF roofing systems are the best investment for your home or commercial facility! For more information about the benefits of SPF roofing systems, please read some of our previous articles:: 0, 1, 2, 3, 4, 5, 6, 7, 8, 9, 10, 11, 12.